Whenever you look at a deer's teeth to age it, especially if it is a smaller bodied and smaller antlered buck, is to look at the third premolar tooth. If it has three cusps, the deer is a yearling (1 1/2 years old). After that it gets a bit more difficult to age a deer, but we can still generally age deer within a year or so. Diet and quality of the diet can have some bearing on how a deer's teeth wear. What follows is basic description of how deer age according to tooth wear. Essentially a deer's teeth wear from the center of the jaw forward and backward. Also of note is that it is important to look at both sides of the lower jaw, each called a "ramus". Some deer are right-jawed and some left-jawed, meaning they spend more time chewing on one side or the other. At 2 1/2 years of age all the teeth are present and none really show any appreciable wear. All the cusps are relatively pointed and sharp. At 3 1/2 years of age the crest of the teeth are starting to show some wear and becoming a bit blunt, and the last cusp on the last tooth looks a bit concave. In typical 4 1/2 year olds the crests of the teeth are almost worn away, and the last cusp on the last tooth is worn so badly that its surface sloped outward and downward. The dentine, the softer inner core of the tooth and much darker in color as compared to the enamel, is as wide as the enamel on the fourth, fifth and sixth tooth. By the time the deer is 5 1/2 years old the crests of the teeth are nearly worn completely smooth and the dentine is considerably wider than the enamel. At 6 1/2 the crest of the teeth are practically gone and most of the teeth appear to be flat. There is also considerable wear on the premolars. 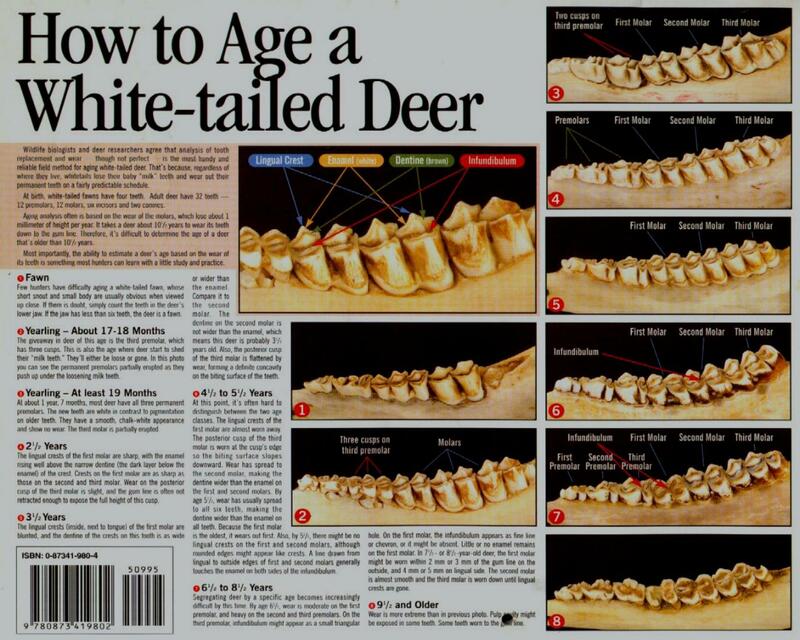 By the time the deer is 7 1/2 years old all the teeth are worn flat and show tremendous wear. After that it gets a bit difficult to accurately age deer.